SIS LIVE, Europe’s largest outside broadcast and uplink supplier, continues its work delivering High Definition (HD) agile cameras and digital RF microwave links for the 34th America’s Cup. The team is currently on location in Plymouth, UK preparing to broadcast the next America’s Cup event which can be viewed live at the SIS LIVE stand at IBC on 10th and 11th September. 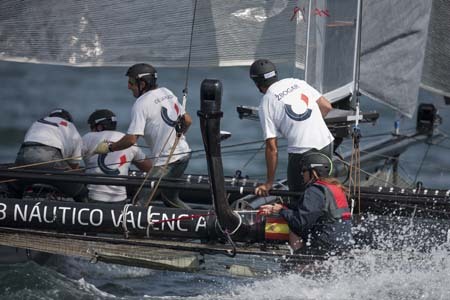 The opening race of the regatta series began on the 6th August in the port city of Cascais, Portugal, a location world-renowned for its magnificent sailing conditions. By the end of the week-long competition, which featured the AC45 wing-sailed catamaran in it’s first-ever competition, the Emirates Team from New Zealand were ahead, having completed the course in an impressive 37m41secs. In taxing conditions, SIS LIVE delivered a resoundingly successful service, utilising 36 newly developed, agile robotic cameras and 7 control units across the 7 live and 3 backup yachts. 16 dedicated engineers multiplexed two vision circuits from each yacht, plus one from each of the three helicopters, one from each of the two TV catamarans, one from the Mark boat and one from the Committee boat to provide 21 simultaneous HD RF links in all. All vision circuits had full camera data control systems which were developed in-house to aid with the capture of images from water and airborne sources. Combined with two radio cameras on the shore SIS LIVE were able to produce exciting coverage of the event and intimate footage of the crews in action. As well as providing the cameras, SIS LIVE handled receive signals from the helicopters and chase boats and, for the first time ever, connected the cameras by the use of IP with great success. By rigging the ariel and power amp at the top of the mast on each boat SIS LIVE were able to employ a land based diversity receive system. This method provided a faultless system with no break-up of pictures whatsoever in the ten days of the regatta. This technique will be applied for the rest of the tournament. SIS LIVE have designed and built in-house a unique rugged waterproof surround microphone designed to mount underneath an HD Pod Camera so that it is almost invisible. Currently 5.0 as specified by America's Cup, this can be easily modified to 5.1. The circular casing is milled from solid aluminium and contains 5 waterproof omni shock mounted capsules along with 5 preamps. The windproofing has been custom built and designed by Rycote and features an easily removable 'headband Windjammer'. As it is 48V Phantom Powered, and is delivered as 5 discrete audios, it is easy to use with any sound desk or recorder. Its size means it is easy to mount almost anywhere. Additionally 5 audios are being provided for Crew Radio Mics and 3 Audios for Spot FX Mics on the Yachts. The multi-million pound contract sees SIS LIVE supply the on-board camera systems over a three-year period to the America’s Cup Event Authority (ACEA), covering two America’s Cup World Series, and including 16 regattas around the globe; the Louis Vuitton Cup, the America’s Cup Challengers Series held July 13 – September 1, 2013 in San Francisco; and the America’s Cup Match to be held September 7 – 22, 2013 in San Francisco. Some of the equipment designed specifically for the America’s Cup will be exhibited at the IBC 2011 conference in Amsterdam, including the aft post of an AC45 which will feature a yacht camera and bespoke designed 5.1 surround sound microphone. The SIS LIVE team is working hard to build upon their achievements as they prepare for the next America’s Cup event to be held at Plymouth, UK from the 10th to the 18th of September. SIS is one of the world’s leading companies in the television broadcasting industry. It is the foremost supplier of television programming and data services to the UK and Ireland betting industry. The company’s broadcast business, SIS LIVE, has the largest satellite uplink fleet in Europe and is the largest outside broadcast provider in the UK. It offers a complete broadcasting solution from onsite outside broadcast facilities through to global distribution and IP provision. The company covers 100,000 hours of live events worldwide each year and credits include The Commonwealth Games, Formula One, Wimbledon Championships and European Tour Golf, and delivers approximately 80% of live news feeds across the UK.